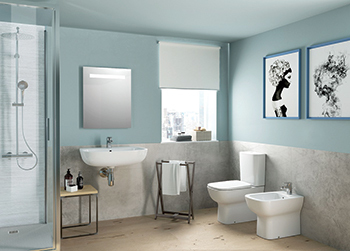 IDEAL Standard has unveiled Esedra, a classic contemporary ceramic range that meets the needs of a modern bathroom space, and doesn’t compromise on practicality or aesthetics. The new line, designed by Studio Levin, exudes a fresh, energetic aura, clean lines and soft rounded shapes, says a spokesman for the leading provider of innovative bathroom solutions. Esedra was created to meet the demands of contemporary life, offering striking design with practical levels of efficiency and unrivalled comfort, he says. Esedra toilet bowls and bidets feature hidden fixtures and a slim soft-close seat that add to the purity of the design lines and ensure easy cleaning. The range has an eco-friendly design and focuses on sustainability; the 4.5/3-litre dual flushing mechanism is a leap ahead compared to older technologies, which allow an average of 1.6 million litres of water to be wasted per year, he adds. The range has also been designed to make installation as less invasive and hassle-free as possible. Esedra’s intelligent design and compatible hardware contributes to quick and clean renovations. Thanks to its universal fixtures, the establishment’s existing water system or walls need not be interfered with. Esedra is ideal for a hotel bathroom as it brings benefits such as energy savings, safety, ease of installation, maintenance and cleaning, the spokesman concludes. 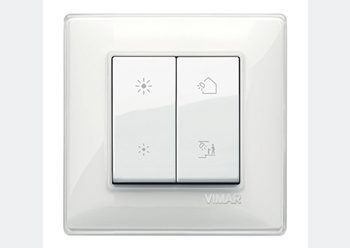 VIMAR of Italy has launched new stylish radio frequency controls that work without batteries and integrate seamlessly with any living environment. The controls perfectly match Vimar’s Eikon, Arké and Plana civil series of electrical mounting frames, offering optimal customisation of shapes, materials and colours. They are an ideal solution for renovations, upgrades, or any installations that have regulatory or architectural constraints, according to a spokesman for the home automation and electrical equipment specialist. “The wireless modular controls can be installed on standard flush mounting boxes or can be placed almost anywhere, on glass or wood surfaces, using double-sided tape. They ensure maximum installation flexibility, since there is no need for masonry work or repainting walls and can be moved if necessary,” he elaborates. Wireless controls are based on ZigBee, EnOcean and Bluetooth radio frequency technologies. The signal is transmitted via radio and they are powered by an electrodynamic generator by pressing the button. Batteries are not required, eliminating the need to replace and dispose of them, thus respecting the environment, he says. These control interface perfectly with products of main players in the lighting technology sector that have adopted Xicato|GalaXi and Casambi technologies, ensuring smart lighting management through the various apps of compatible lamp manufacturers (such as Flos, Targetti and Osram), in both residential and commercial spaces. Grohe, a leading provider of sanitary fittings, has launched its new Euphoria SmartControl shower system to offer customers ‘the right mix for every shower experience’. The new surface-mounted installation provides a significantly slim form of the SmartControl control unit as well as convenient temperature regulation, thanks to the Grohtherm thermostat, says Grohe. Grohe Euphoria SmartControl features Germany technology and quality comprising multi-jet shower heads. 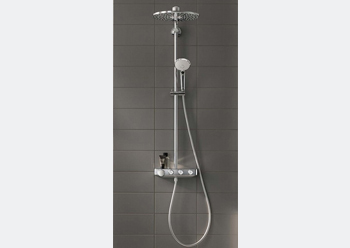 The smart shower system’s centrepiece is the combined, front-mounted push and turn control unit. “From now on, the experience of “Push, Turn, Shower” will be even more multifaceted: The smart technology becomes part of another successful Grohe design line – Grohe Euphoria SmartControl,” says a company spokesman. The knobs can regulate the amount of water, depending on one’s individual mood, from a gentle shower to a vigorous refreshment, states the spokesman. By pushing a button, the spray types can be selected. After switching off the water, the system automatically saves the selected flow rate until the next shower, he adds.